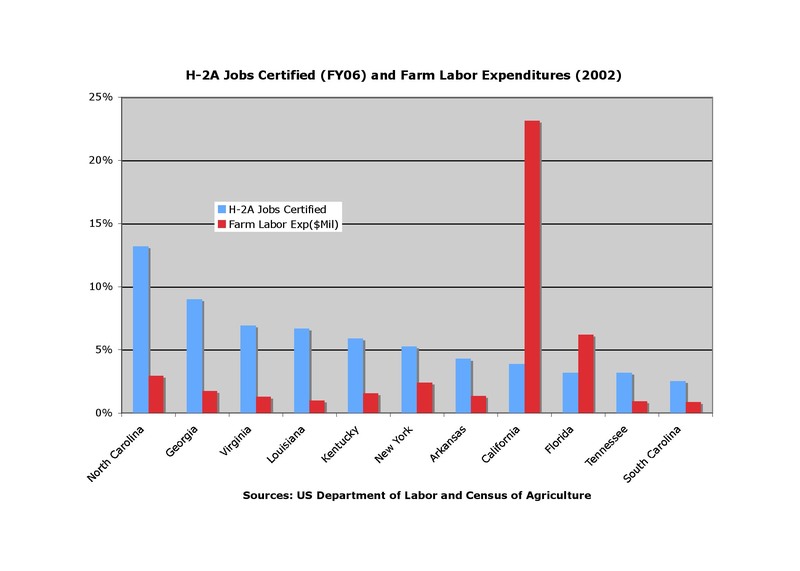 In FY06, the US Department of Labor certified almost 60,000 farm jobs to be filled with H-2A workers, the most ever; between 1970 and 2000, the number of jobs certified to be filled with H-2A workers ranged from 15,000 to 25,000. Many H-2A visa holders fill two or more H-2A jobs during the year, so the number of workers admitted is usually about half the number of jobs certified. In 2002, farmers reported spending almost $19 billion on workers they directly hired. There is little correlation between H-2A jobs and farm labor expenditures. Eight southeastern states stretching from the Carolinas and Georgia to Arkansas and Louisiana accounted for 52 percent of the H-2A jobs and 12 percent of farm labor expenditures.